In the morning, we could see the golden sunlight on the mountains on the other side of the Spiti river. 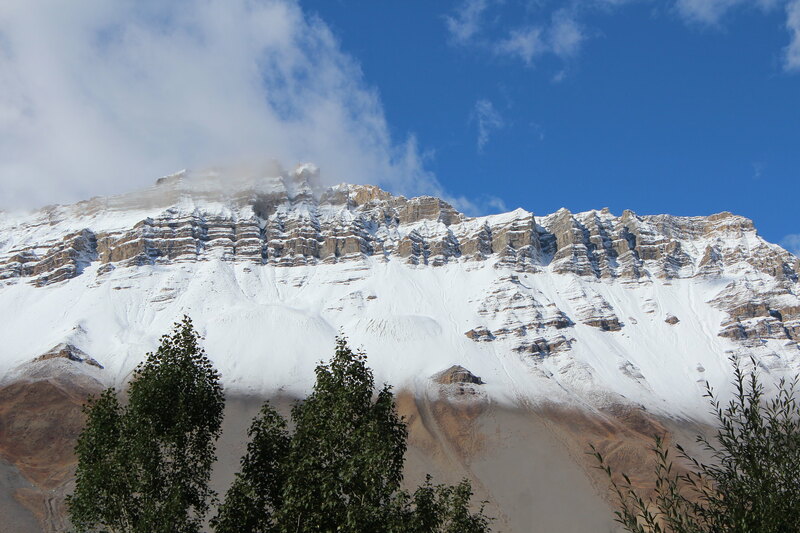 Kaza is a small town located 200 km from Manali and 427 km from Shimla via Nako. The district 'Lahaul and Spiti' comprises of two Tehsils - one headquartered at Keylong and the other at Kaza. Keylong also serves as the district headquarter. There are high mountains on both sides of the valley. 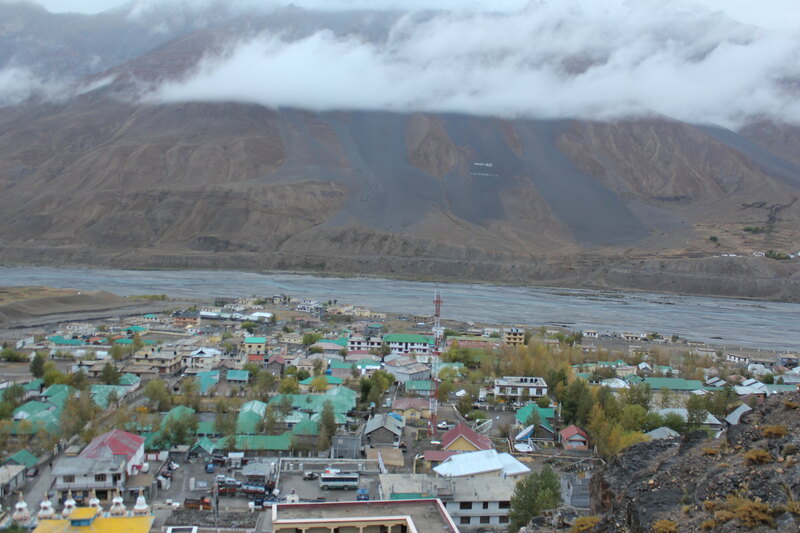 In the valley, Kaza town is located and the Spiti river flows in the valley. You can find amenities like ATM or petrol pump only in Kaza after Manali in this route. At the petrol pump, we also saw a signboard mentioning that it is the highest petrol pump in the world. I think on this trip we got used to the adjective 'highest.' A peak, a petrol pump, a post office or a village can be the highest in the world or among the highest. 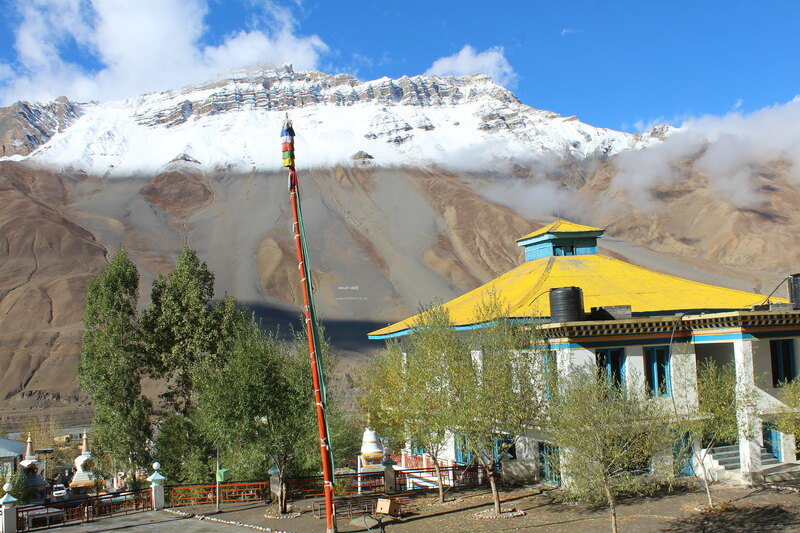 Given the proximity of places from here, to visit in Spiti valley Kaza can be made a base camp if a long stay is planned in the valley. While seeing towards the mountains on the other side of the valley, there was something different from the previous day. It was the snow which was covering the greater part of the mountains than it did on the previous day. Our driver had told us yesterday that if it would rain like this for the whole night, then the temperature would drop and we might have snowfall in the night. I did not know the exact science behind the snowfall, so I believed him thinking that his experience in the hills might enable him to predict correctly. The very next day we got to know that there was snowfall in the night. I thought more about this incident. Very often we consider such things against science and deem them to be trivial and is not based on solid logic. In the Bollywood movie Swades, Shahrukh Khan is working with NASA and tells that his work is concerned with meteorology. Then he is ridiculed by villagers for that as even a layman from the village can tell when will it rain just by seeing the sky. Now, here we assume that the layman is not a scientist. When we observe closely we can see that he is following the scientific methods unknowingly. The moment we place science as something practiced by highly trained professionals, we lose the essence of science. Any discipline or work which uses the scientific methods to reach a conclusion is a science. It raises a question now - what is the scientific method. I will not go into details of scientific method here, but broadly any work where you think of a hypothesis and then do experiments to verify your hypothesis can be called to be a scientific method. Remember, this is only a broad definition. A layman predicting the weather is based on the knowledge passed on for many centuries. Observation tells him that a particular pattern of clouds and a combination of temperature and wind causes rain. If this cause-and-effect relationship proves wrong too many times, then this has to be changed. Some other relationship between those environmental factors will take its place after being tested by too many persons for too many years. That is how the science works - the science that we have been taught, the science that takes its form in laboratories. Had it not been a science, there would have been a discussion on whether the observation is right or wrong, but only observation, in this case, is either it rains or not. So if the theory of the layman goes against the observation too many times, he has to change his theory or he has to come with a theory which can explain the anomalies. And, here it can be distinguished from the arts where there is no clearly defined hypothesis to be followed in order to produce a beautiful piece of art. In the morning, we went to the monastery in Kaza. Compared to other monasteries in the region, it is not very old. It was blessed in 2000 by His Holiness the Dalai Lama. In that monastery, we saw few patterns which will be found in all the monasteries in the region and in monasteries beyond the Spiti Valley like one in Dehra Dun. First, the monasteries were very colorful from the outside and inside. Rarely you will find so many colors in the places of worship of other religions. The art in sculpture is seen in the Hindu temples but it is a different matter here with the colors. Well, the Gopurams of Meenakshi Temple in Madurai can be the exception. 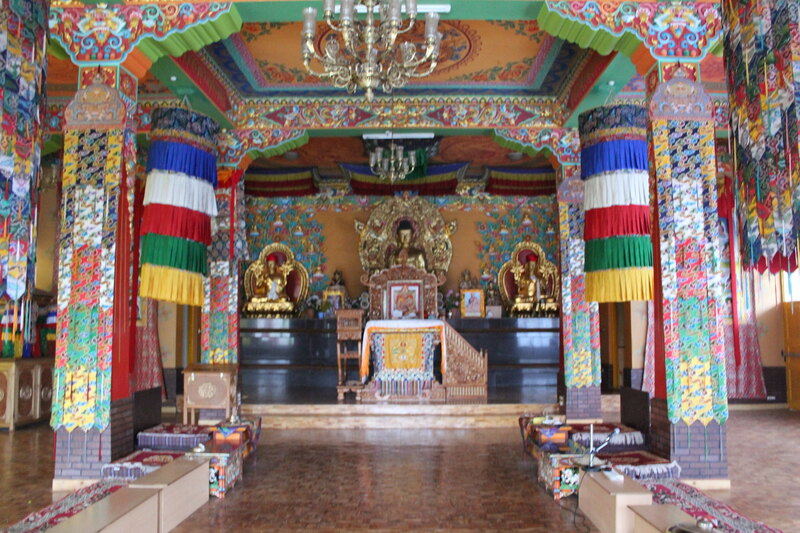 Second, in these monasteries, a big picture of a religious teacher is kept like of Dalai Lama and is given a place which is reserved for the deities in temples. Hinduism has its own tradition of deifying the religious preachers but that is not as universal as it is found here in these monasteries. There we had a talk with a monk, in their language a Lama. He told us that this monastery belonged to the Sakya sect of the Buddhism. We came to know that there are different sects of Buddhism alive in Spiti valley and they have separate monasteries. Even then, the Dalai Lama is such a towering figure that he is respected by almost all the sects. We waited for the morning prayers in the monastery. It was a sober affair. Three Lamas chanted sacred verses and at fixed intervals they would beat the drums, blow the trumpets and play the cymbals. We were served tea there and I took it as Prasad served in temples, although, I am not sure if monasteries have a tradition of distributing Prasad.